There is no question that birth at extremely low gestational ages presents a significant threat to an infant's survival, health and development. Growing evidence suggests that gestational age may be conceptualised as a continuum in which births before 28 weeks of gestation (extremely preterm: EP) represent the severe end of a spectrum of health and developmental adversity. Although comprising just 1%–2% of all births, EP deliveries pose the greatest challenge to neonatal medicine and to health, education and social services for the provision of ongoing support for survivors with additional needs. Studying the outcomes of these infants remains critical for evaluating and enhancing clinical care, planning long-term support and for advancing our understanding of the life-course consequences of immaturity at birth. Here we review literature relating to early and long-term neurodevelopmental, cognitive, behavioural and educational outcomes following EP birth focusing on key themes and considering implications for intervention. Survival of live births in large population-based studies 2003–2011. NICHD, National Institute of Child Health and Human Development; w, weeks. Most neonatal services now monitor neurodevelopmental outcomes to 2–3 years. Using similar techniques, EPICure-2 demonstrated increases in survival without disability for babies admitted for neonatal care at 23 weeks (OR 1.4 (95% CI 0.68 to 2.7)), 24 weeks (OR 1.8 (95% CI 1.2 to 2.7)) and 25 weeks gestation (OR 1.9 (95% CI 1.4 to 2.6)) between 1995 and 2006, whereas the prevalence of severe disability was unchanged (18% (95% CI 14% to 24%) in 1995 and 19% (95% CI 14% to 23%) in 2006).5 Key conditions are cerebral palsy (CP), developmental impairment and, to a lesser extent, sensory impairment. The prevalence of such impairments among survivors appears to be independent of differences in survival between studies.6 Although the individual predictive value of early assessments is relatively poor, in population terms the proportions with severe and moderate impairment have remained very stable over childhood,7 making such data useful to support parental counselling. The prevalence of CP in the extremely preterm (EP) population and in those of extremely low birth weight (ELBW; <1000 g) is declining across Europe.8 In the EPICure-2 study of birth ≤26 weeks gestation in 2006, the proportion with moderate to severe CP (with Gross Motor Function Classification System levels 3–5) comprised 9% of survivors at 22–23 weeks, 5% at 24 weeks, falling to 2% at 26 weeks. Most survivors with neurological abnormality had only mild functional impairment. Changes in the prevalence of developmental impairment over time are more challenging to assess as consecutive editions of developmental tests are not equivalent. The current edition of the Bayley Scales (the Bayley-III) in particular produces higher scores compared with its predecessor and seems to be less discriminatory in the lower performance range,9 clearly the important area of assessment. However, using a correction algorithm, the EPICure-2 study demonstrated an 8 (95% CI 5 to 10) point increase in scores between 1995 and 2006 at 2–3 years of age, particularly for those born at 24 and 25 weeks of gestation. It is unclear as yet whether this will translate into improved school-age outcomes. Sensory impairments are much less prevalent and are less well understood. In EPICure-2, only 1% of survivors had severe visual or hearing impairments, and moderate impairment was found in 6% and 5%, respectively, at 2–3 years. The origin of these impairments is unclear. Most visual impairment, for example, appears to be central in origin rather than the result of retinopathy, which is in the main treatable. Important somatic impairments—long-term respiratory impairment10 or increases in cardiovascular risk11 for example—are common in such populations, but it is difficult to quantify their impact in infancy and early childhood, although these may become more important in later life. Cognitive impairments far surpass rates of neurosensory disabilities in EP populations. Meta-analyses have identified weighted mean differences of 11–12 IQ points in preterm versus term-born children, equating to 0.7 SD to 0.8 SD deficits relative to controls.12 ,13 IQ is significantly associated with gestational age at birth, with a 14-point weighted mean difference (∼1 SD) reported for cohorts with mean gestational age <28 weeks.13 Even greater deficits have been reported for those born nearer the limits of viability with a 20-point (95% CI −23 to −17) deficit for children born <26 weeks, of which 40% had intellectual disability compared with just 1.3% of controls at 11 years of age.14 It is as yet unclear whether there is a linear relationship between IQ and gestational age for those born below 33 weeks only15 or for all gestations below full term,13 or whether there is an exponential relationship with gestational age as evidenced in educational data.16 Low IQ is the product of social disadvantage, genetic influences and prematurity with the effects of environmental factors exerting a greater role over time. There has been increasing interest in studying neuropsychological outcomes and, in particular, in understanding the specific cognitive deficits associated with EP birth in order to elucidate targets for intervention. Numerous studies have reported significant deficits in a range of basic cognitive processes, including short-term memory, processing speed, visual-perceptual skills, sensorimotor integration and attention in EP children relative to term-born controls.17 Such deficits have been observed from school entry through adolescence.17–20 In particular, there is growing interest in executive functions, a set of inter-related cognitive processes that allow individuals to respond flexibly to the environment and to engage in purposeful, goal-directed behaviour. Such processes are variously defined and often include, but are not limited to, inhibition, planning, shifting or cognitive flexibility, working memory and verbal fluency. Identifying pure measures of executive functions and the task-dependent nature of performance on such tests can make comparisons between studies problematic. However, meta-analyses of data from studies of very preterm (VP; <32 weeks)/very low birthweight (VLBW; <1500 g) cohorts have reported small to medium effect sizes (0.25 SD to 0.57 SD) for deficits in inhibition, working memory, planning, cognitive flexibility and verbal fluency,21 ,22 with greater deficits observed in children born <26 weeks gestation.21 Deficits in executive functions have also been observed on parent and teacher reports in EP/ELBW children and appear to persist over time.19 ,23 ,24 It is also thought that these may be core cognitive deficits that underlie much of the psychiatric morbidity and learning difficulties in this population and are thus being explored as targets for intervention. Authors have also reported that 21%–41% of EP children screen positive for the risk for autism spectrum disorders (ASD) at 2 years corrected age on the Modified Checklist for Autism in Toddlers (M-CHAT)30 parent questionnaire.31 ,32 However, although these rates are higher than the 9% generally reported in unselected samples,30 ,33 the true proportion with ASD is likely to be lower as infants may screen positive due to the range of neurodevelopmental impairments commonly observed after EP birth rather than autistic features per se.31 ,32 ,34 Where the M-CHAT follow-up interview is used to improve specificity, as prescribed by the authors, a positive screen rate of 13% has been reported in EP infants and a 1.8% prevalence of diagnoses at 2–4 years.35 The M-CHAT is therefore likely to identify children at risk for a range of developmental disorders and should be used with caution when screening for ASD until its predictive validity for later diagnoses is ascertained. 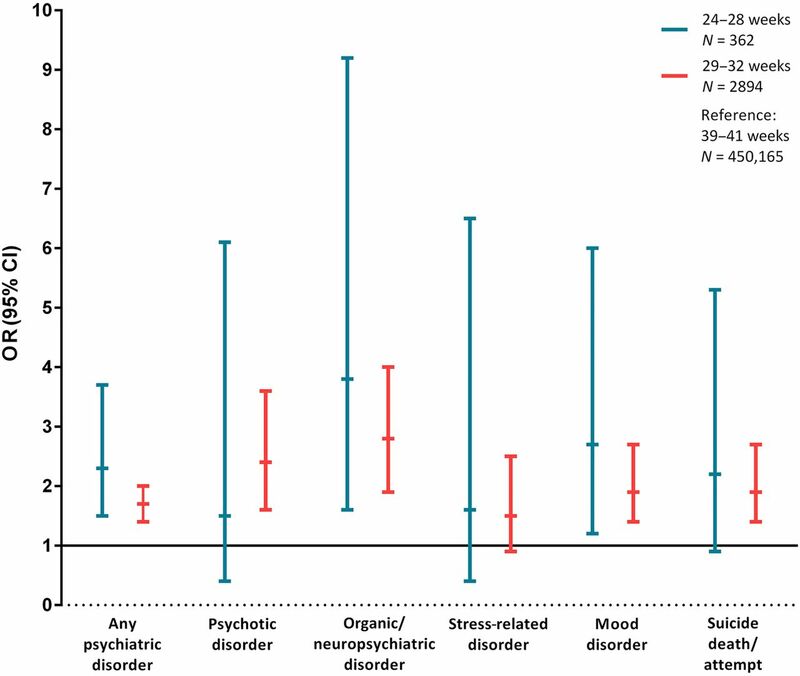 Psychiatric morbidity in adolescents and young adults born very preterm (figure created using data from Lindstrom et al64). Despite the persistence of health and neurodevelopmental sequelae, VP/VLBW adults are perhaps functioning better than might have once been expected with a significant majority leading independent and self-supportive lives.57 Although VP/VLBW adults may have lower wealth and job-related income, they have similar rates of employment to term-born adults56 ,59 and self-perceived quality of life is similar to controls with many managing the transition to adulthood as well as adults born at more mature gestations.57 These results are encouraging and the clinical and academic communities are eagerly anticipating publication of outcomes in adulthood for the earliest EP cohorts assembled in the 1990s and beyond. The persistence of neurodevelopmental sequelae from infancy to adulthood underscores the need for preventive intervention. Increased recognition of the association of sensitive and responsive parenting with later school-age outcomes suggests that interventions to improve parent–infant interaction might be beneficial.69 However, evidence for the efficacy of post-discharge programmes for enhancing cognitive and developmental outcomes is limited; even where short-term effects have been reported, these are rarely sustained beyond the period of intervention delivery and into school age.70 In recent years, attention has turned to the potential for working memory training to improve cognitive and educational outcomes in preterm populations. However, although these might show short-term gain in terms of improved working memory, there is as yet no evidence of generalisation to other outcomes either in preterm children or those with working memory deficits.71 ,72 Given the heterogeneity in outcomes and the wide range of deficits experienced by EP children, interventions that are delivered during the school years and those that target the multiple cognitive processes affected by EP birth may be beneficial. Such efforts might focus on the development of new population-specific interventions or on trialling the efficacy of existing teaching strategies in EP children. Given the preterm behavioural phenotype described above, EP children are often characterised as anxious and inattentive, but not as hyperactive or disruptive in the classroom. As such, EP children with difficulties may not come to the teacher's attention as readily as other children with externalising behaviour problems or with other SEN. Thus, informing education professionals about the special constellation of problems following EP birth may help them to identify those with difficulties and provide appropriate support in the classroom.73 From a parent's perspective, delaying school entry might be considered as a potential intervention to help improve their child's performance at school, especially for those who feel their child is developmentally immature and/or is born in the summer months. However, recent evidence suggests that delaying school entry is unlikely to benefit preterm children's academic attainment and that starting school at the age-appropriate time and ensuring support for those with difficulties may be more appropriate.74 However, more research is needed to provide a definitive answer as to whether delaying school entry might benefit children's academic, emotional and social outcomes in the long term. Improved survival rates for EP births over recent decades have not yet been matched by clear evidence of a reduction in rates of neurodevelopmental disability. A high prevalence of intellectual disabilities, behavioural, social and emotional problems and learning difficulties continues to dominate the literature relating to childhood outcomes and recent reports have confirmed that these difficulties persist into adult life. Neuropsychological deficits appear to mediate the relationship between EP birth and long-term outcomes and may represent potential targets for intervention, though evidence for the long-term efficacy of early intervention efforts remains limited. Longitudinal studies with follow-up into adulthood are needed to determine the impact of EP birth in relation to contemporary care and to identify whether ongoing improvements in neonatal medicine have translated into improved outcomes across the lifespan. Although a substantial proportion of EP survivors are likely to need intervention to facilitate their performance at school and to support their mental health and well-being throughout childhood and adolescence, outcomes may be better than once anticipated with most EP adults living independently and with a good self-reported quality of life.
. Psychiatric disorders in extremely preterm children: longitudinal finding at age 11 years in the EPICure study. J Am Acad Child Adolesc Psychiatry 2010;49:453–63.e1. Contributors SJ and NM contributed equally to the drafting and revision of this manuscript. Funding NM receives part funding from the Department of Health's National Institute for Health Research Biomedical Research Centre's funding scheme at University College London Hospital/UCL University College London.